Some of you following our blog are well aware that January is an exciting month for us at XOMNI. It is the month where we travel to beautiful New York City for the NRF Expo. As usual, we did our homework for NRF and we have some exciting news to share. This time, it is a new product; XOGO. XOGO is not your traditional Digital Signage, in fact we call it Decision Signage. XOGO is a very low cost yet highly interactive assisted selling digital canvas for our partners and customers to leverage. Our Dev team is so excited, they wanted to tell you about it themselves! We wanted to build XOGO to help every retailer, ranging from single store retailers to those with thousands of locations. Unique to XOGO besides its extremely low cost is the ability to leverage existing in-store screens, or quickly add one for the first time. Simply plug in a $35 player device and use existing mobile devices for management. Make sure you hit that play button on the video above to see some action and get more details. At only 5 minutes long it will be well worth your time! Also, if you are at NRF 2016, drop by the Microsoft booth and ask for XOMNI or XOGO. If your are not at the expo, feel free to watch videos captured from NRF 2012 for some nostalgia or from 2014 and 2015 if you are looking for the latest. This entry was posted in Announcements, Stories, Uncategorized and tagged NRF, XOGO on January 16, 2016 by XOMNIAN. With hundreds of millions of devices connected to the internet today, everyone talks about BigData and IoT. We don’t just implement the features and technologies in our cloud platform for retailers to enjoy, we are part of the discussion as well. 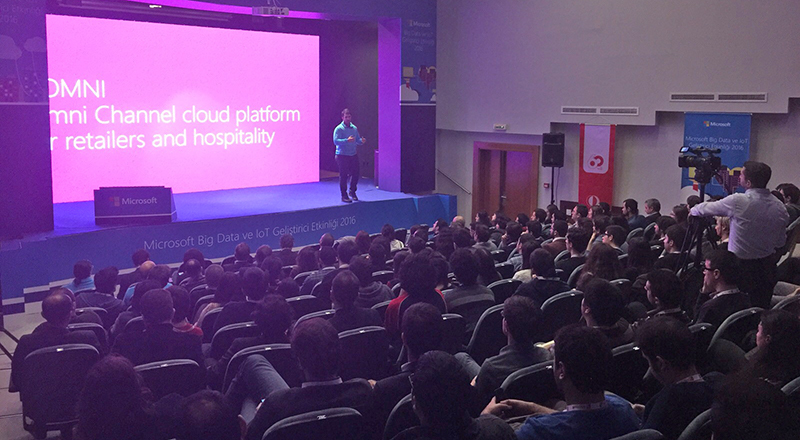 The BigData and IoT Conference in Turkey hosted Satya Nadella, CEO of Microsoft as the keynote speaker. Just before Nadella’s session our CTO, Daron Yondem had the chance to talk about what we do in the BigData and IoT space. If you would like to chat about BigData and IoT in retail we will be at NRF 2016. (Javits Center, New York in January 17-20) Hope to see you there! This entry was posted in Stories on January 7, 2016 by XOMNIAN.